Private taxis cost around $50 to go from Siem Reap to Battambang or vice-versa. 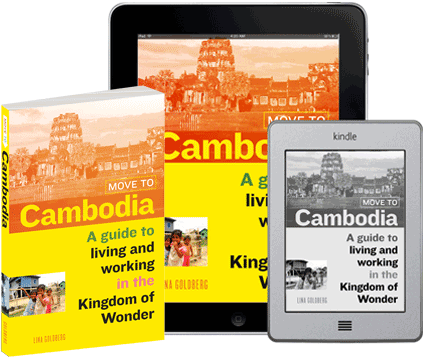 As with most taxis in Cambodia, the preferred vehicle is the Toyota Camry which can fit four passengers, but it can be a tight squeeze and the trunk is rarely empty, so if you have more than three people, travel light. You can hire a taxi through any local guesthouse or travel agent, but if you book a taxi online in advance you’ll get an SUV taxi for around the same price. You can also book an 11-seater van for $90. The trip takes two or two-and-a-half hours. The Mekong Express mini bus, also known as the ‘VIP van’ that goes between Siem Reap and Battambang. 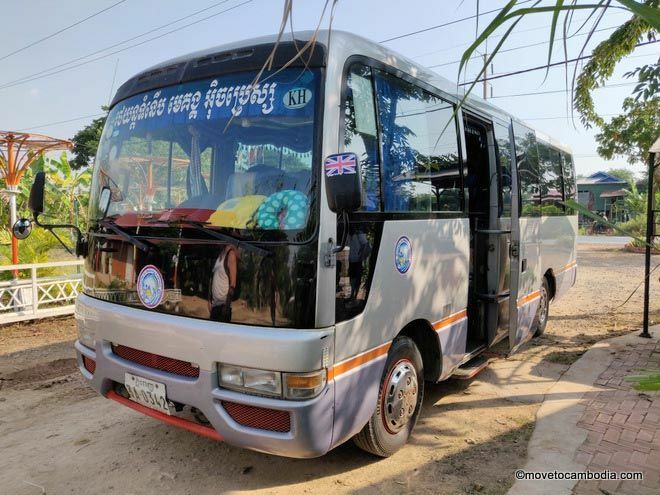 After a hiatus, there are again mini-bus shuttles traveling between Siem Reap and Battambang. Mekong Express are now running two buses every day in either direction at 8 a.m. and 2 p.m. They rotate between 18, 25, and 40 seat vehicles (so mini-buses and full-size buses). Mekong Express is a long-time tourist favorite because they have a good safety record and are relatively reliable. The bus offers the best balance of price and speed, although the roads pretty bumpy at the moment (with promises the road will be sealed at some point in 2019). If you want to know more, we’ve got a full review of the Mekong Express buses between Battambang and Siem Reap. Siem Reap to Battambang: 8 a.m., 2 p.m.
Battambang to Siem Reap: 8 a.m., 2 p.m.
Tickets cost $7 for non-Cambodians and can be booked online where you can reserve a seat in advance. The trip takes between three hour and four hours. 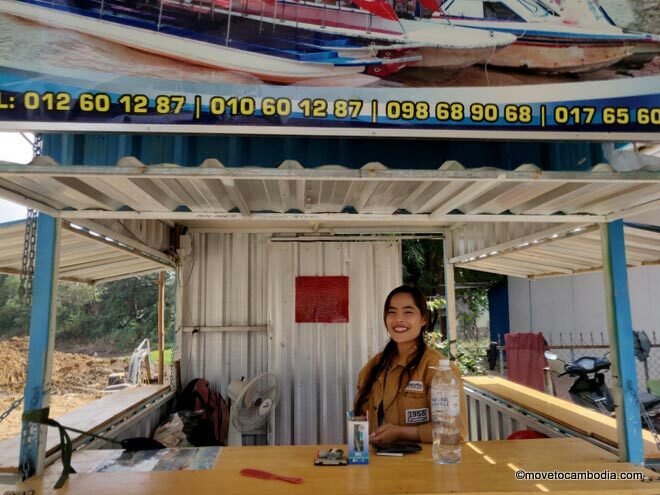 This is not the actual boat, but rather Srey Leak, the lovely woman who collects the tickets in Battambang. Boats between Siem Reap to Battambang leave at 7:30 a.m. each day in either direction. The trip takes between six and eight hours, depending on the season and how high the water level is, and which direction you are going; the trip from Battambang to Siem Reap is shorter than the other way around. The views are gorgeous, passing by many small fishing villages, allowing visitors to get a sense of life on Cambodia’s riverside. If you’re considering taking the boat, know that the wet season is the best time to take it due to higher water levels, but be sure to bring both sunblock and some sort of rain protection (you can get cheap ponchos for 2,000 riel at any small shop). Tickets cost $25 per person and it’s possible to book tickets online in advance. 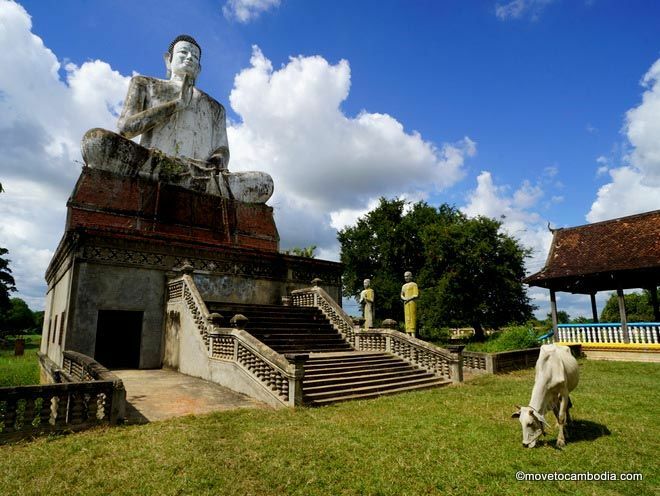 This entry was posted in Transportation, Battambang, Siem Reap and tagged Mekong Express, Cambodia taxi, Siem Reap to Battambang, Battambang to Siem Reap. Bookmark the permalink. Hello. On a Mekong Express van that has 25 seats.. a middle row with two seats on each side.. is there a “best seat” for someone with long legs? Thanks. We’ve just done it…Was sat directly behind driver …maybe slightly more leg room if you are on outside seat …air con was shocking either blowing hot air or freezing ! Really happy to have found this website with so many useful information! Thx for your time and experience! Thank you for the detailed info. It helped me great. In February I will be in Siem Reap and I was wondering how I can go to Battambang. It seems mini bus is the best option. If boats would be safer and cheaper I would definitely consider it. If I can’t go to a floating village tour, I might consider it also. Thank you again! Just a small an update. I am currently travelling from SR to BtB with Kapitol and the bus is just fine! Seems to be quite new, air con is working and the bus left on time.